So 2013 draws to a close, and at this point I am confident I can present my summary, sure that nothing else will be finished before the New Year. I set out at the start of the year with a strong intention to paint more than I did in 2012 (click for link); 2012 was a pretty poor year. I began to change my painting style at the end of 2009, and it has continued to evolve since. That has coincided with my interest in low-model count skirmish games. Prior to that my main gaming buddy Rob and me set out to try and play with painted minis as far as possible (something we headed towards in our WH40K days). So the numbers of models I painted each year dropped (not sure of the exact totals for 2010 and 2011) to the low-point of 2012 where I only painted 24 minis. 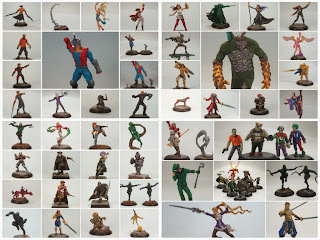 So I set a personal target of 48-50 minis for 2013 (I am not sure I actually published the target to begin with). 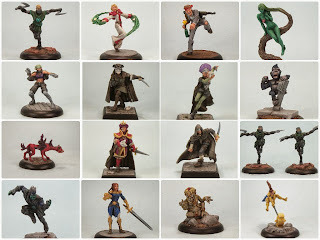 It took until the end of July for me to start to open up any clear distance over that target and in the end after paining Sho on the Anima Tactician I have painted 63 minis across several ranges, as well as odds and ends of scenery. A much better year than the year before! So October was clearly my best month of the year with 10 minis and February my worst (although Giant Hadron was finally finished as the only mini of that month!). Merry Christmas to all readers; I hope you all enjoy a wonderful festive period. For your enjoyment, there is a Christmas-themed Pulp City Battle Report over on the Pulp Citizen (click for link). Knight Models have issued a free download updated rule book for the Batman Miniatures Game. The English-language translation this time looks much better, thanks to the involvement of a couple of native speakers no doubt. This is a full update, with new layout and content. 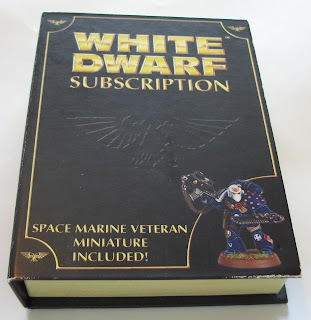 With the page count I think I will be waiting until a print version is available, but this is an excellent step forwards by Knight Models I reckon. I suggest heading over to their site and downloading this if you are interested in the game. 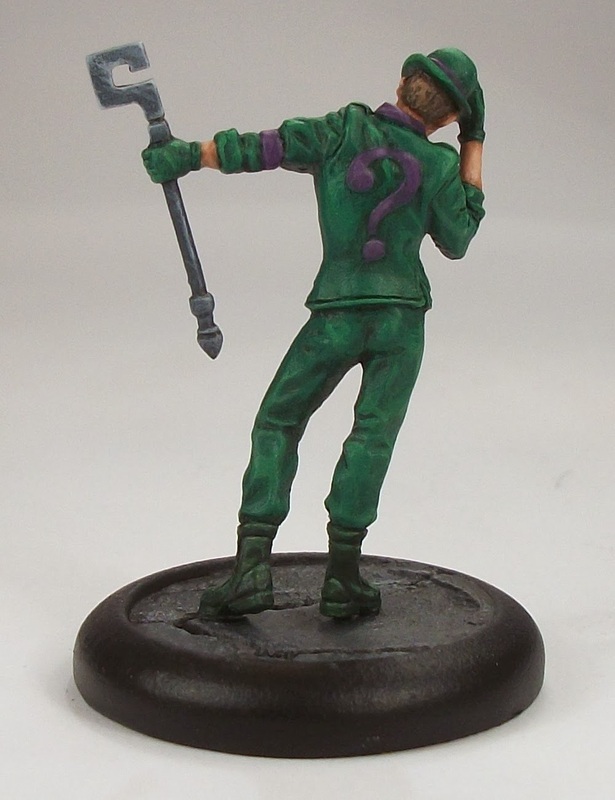 The Riddler is my first finished mini for the Batman Miniatures game/DC Comics range of models from Knight Models. As soon as I saw the first mini in the line (Batman, naturally) I was impressed, and when I learned of the range I was in. 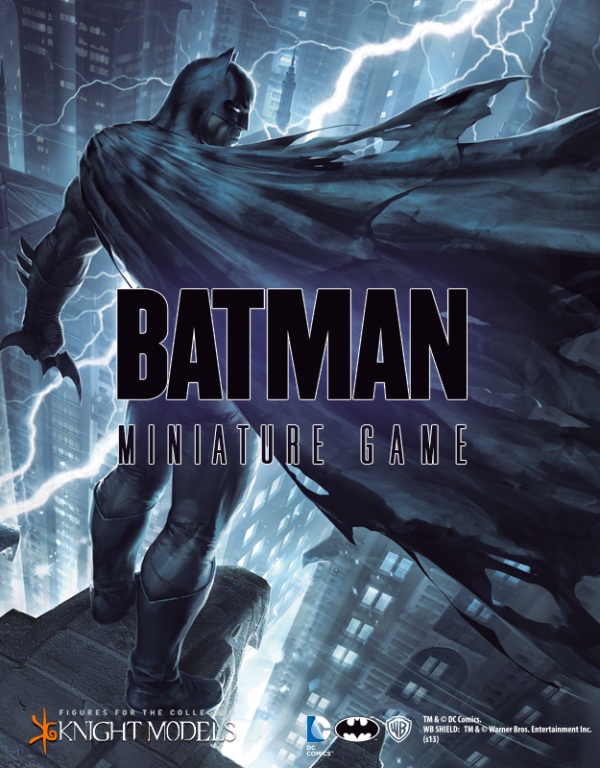 I don't play the Arkham series of video games which much of the imagery and character design for this range is drawn, but I do like the minis range. A lot. So much so I can see myself collecting the loot given a chance. They have already begun to diversify the line to include DC Comics characters from outside the games (Deathstroke; Green Arrow), Watchmen characters, and other DC movie characters (some Dark Knight characters; Superman as seen in the Man of Steel), so it is an increasingly eclectic mix. I don't know that I will ever actually play the game to be honest. The current English translation is in need of a lot of work I feel, although it clearly has a strong following among fans of the rules, and I have a much more established preference when it comes to super-powered gaming! But the minis are mostly great, although the metal is super-soft which is less than pleasing, and at least one mini (DKR Bane) is clearly out of the established scale, but they are tolerable issues. 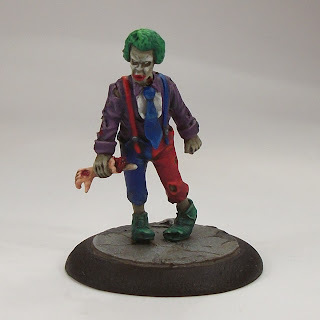 Until Zomtober 2013 kicks off, time for my quarterly update. The update features another collage using fotor (and amazingly, I exceeded fotor's in-built collage image limit, so a creative solution of putting a collage in a collage was needed!). Q1 yielded 13 painted minis. 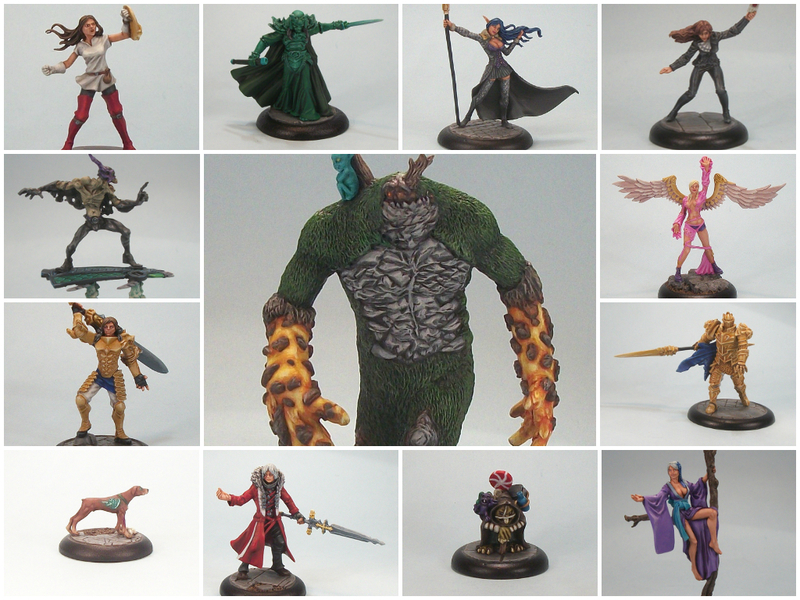 Q2 also yielded 13 painted minis. 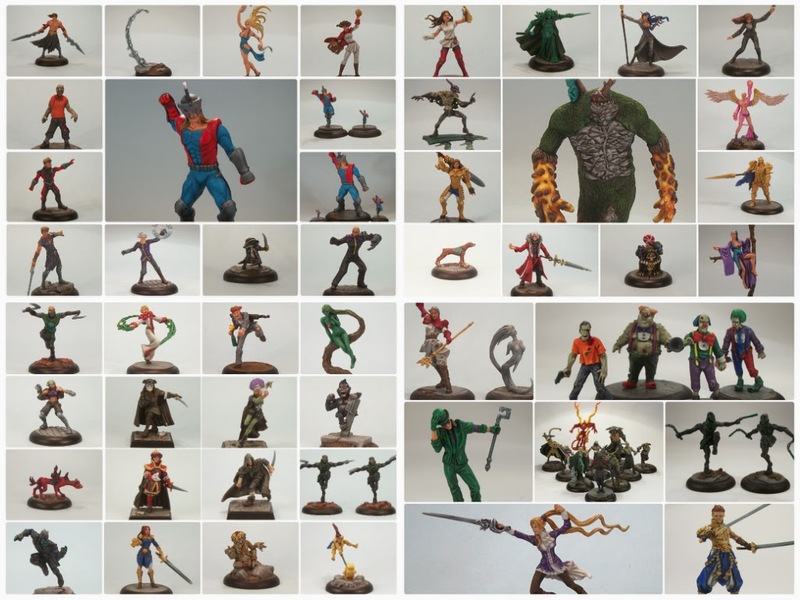 Q3 surpassed that standard with 17 painted minis. That takes me to 43 of my 50 target for the year - it looks like with 3 months to go (including a planned 4 models for Zomtober), that is an achievable goal. Nothing too large this month unlike the Wrath of Nature last quarter, or Giant Hadron in Q1, but still 17 minis done. And that is even with the disappointment of not yet painting a couple more Ninjas (for Pulp City), or painting more for Anima Tactics (I would have liked to have painted at least a couple more Anima Tactics mins). 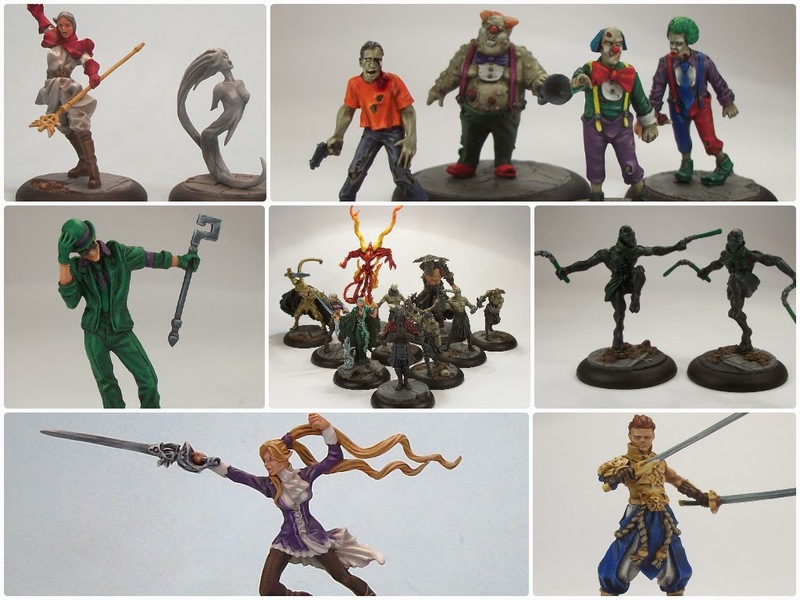 Q3 saw me paint stuff for Anima Tactics (6 minis), Pulp City (6 minis), Freebooter's Fate (4 minis), and MERCS (1 mini). 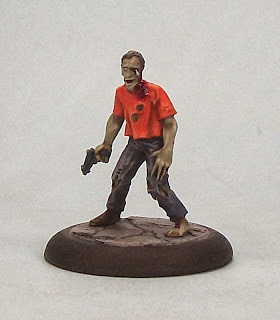 Zomtober 2013 is nearly here. 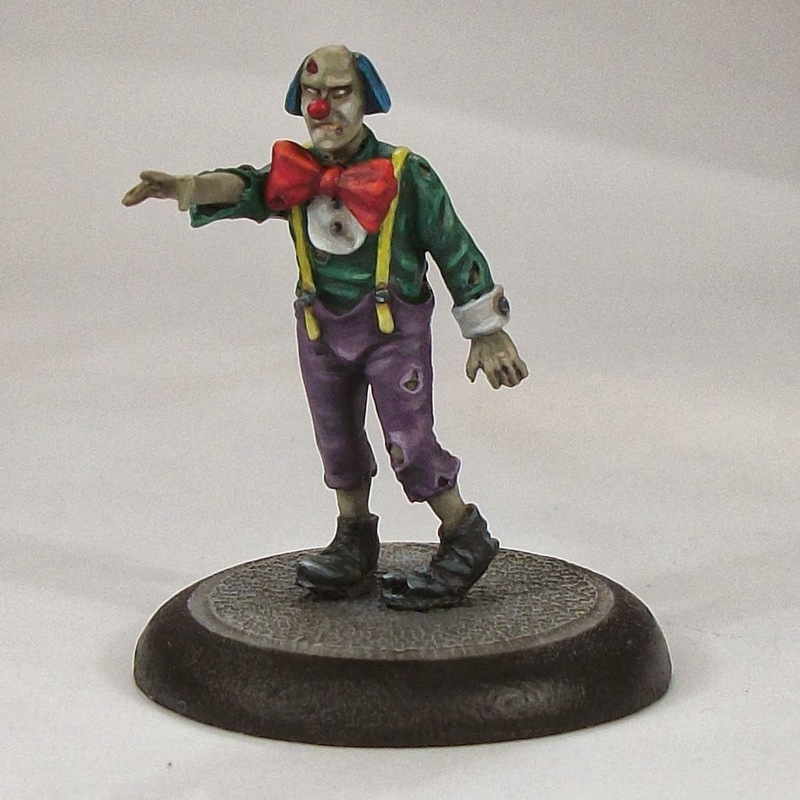 The dead will walk off painting stations and into minis cabinets and cases. 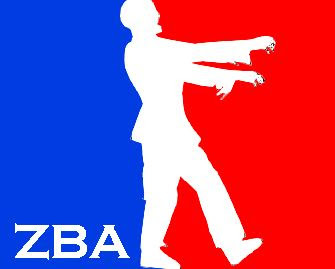 The Zomtober gauntlet is thrown down once more! 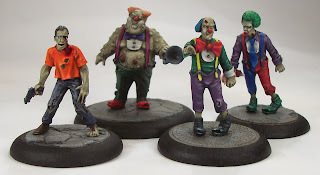 So far we have myself, Rob (his blog can be found here) and Simon Q (his blog can be found here) and anyone else who wants to get some walkers, runners, fat zeds, boss zeds, or even hapless survivors painted. So if you want to join in (and we can link to your own blog), let us know! As for the ground rules: paint at least one Zombie or Survivor per week, simples! Deadlines are 67th, 13th, 20th and 27th of October. More living impaired contagion is unleashed! Lord Siwoc of Brains and Guts!! Panzer Kaput of PanzerKaput's Painted Review plans to join the fun, doubling up in week 2. Okay, this was a a typical surprise for me - I say surprise as this was started after the other FCC, but finished before them, which is fairly typical for the random way I approach much of my painting! The Saboteur is a model for the FCC House 9 faction for MERCS. In the corporately-controlled future world of MERCS, the FCC are an anti-corporate affiliation or largely like organizations that operate independently of each other. House 9 is based in the middle and near east and may be considered freedom fighters or terrorists depending on point of view! 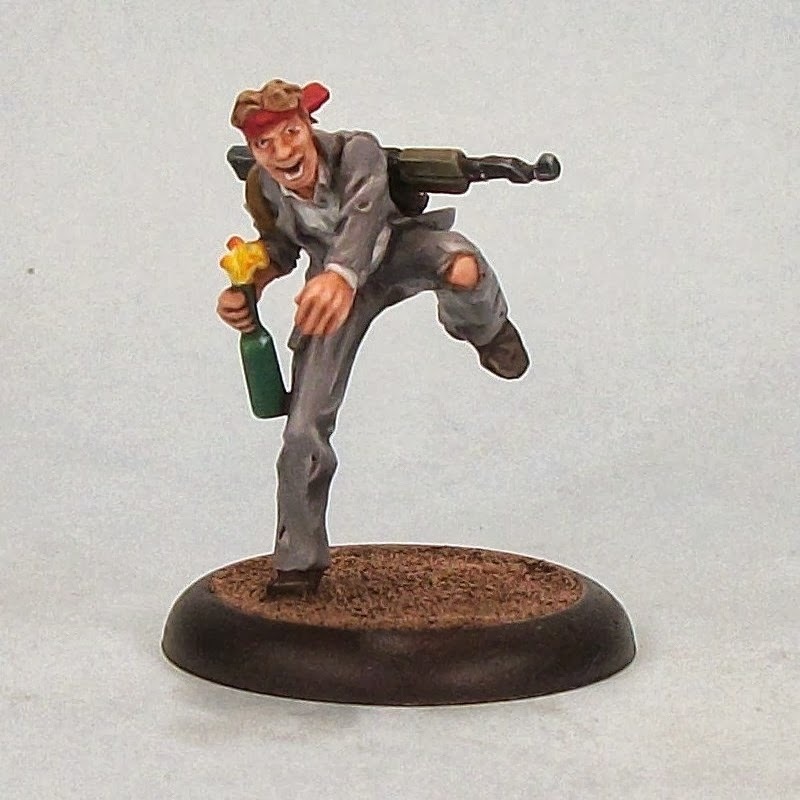 The Saboteur exemplifies that idea with his rules representing his civilian appearance (harder to pick out among other combatants - penalty to hit; encouragement to allies if martyred - a bonus if removed from the game). Being armed with a a Molotov Cocktail and the futuristic equivalent of an AK-47 just finishes the package off! It will be interesting to see how the game plays. 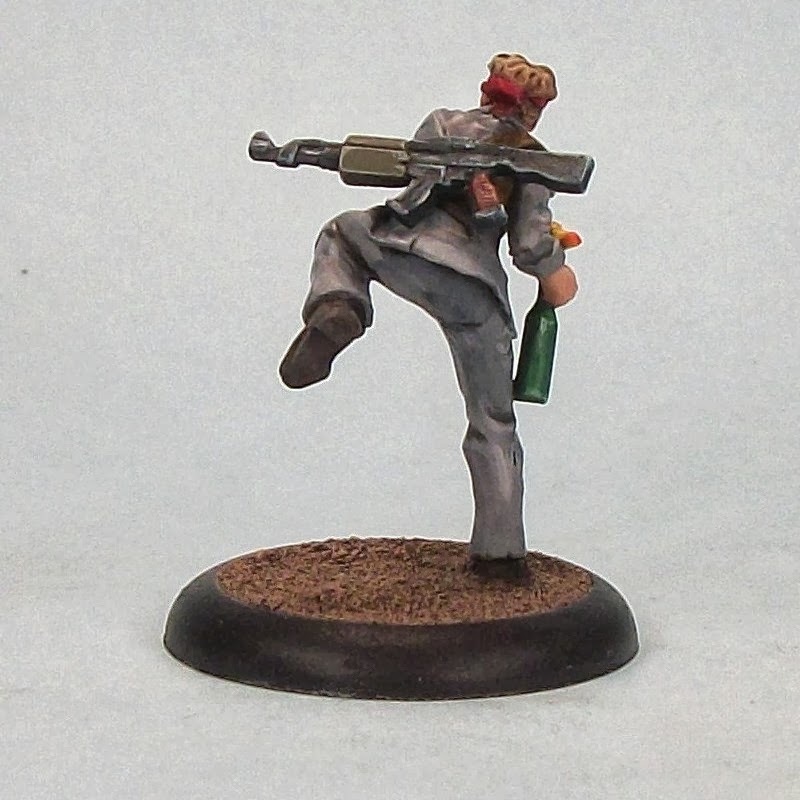 Right now my focus for low model count skirmish games is on Pulp City; Anima Tactics; Freebooters Fate; and now MERCS. Each offers its own unique game-play features, and MERCS looks no different. I look forwards to finally getting to grips with some games when i have some factions painted up. Colour-scheme wise, I have actually used the same palette that I am using on the para-military FCC House 9, so he should still tie-in with the rest of the unit. Hopefully work will continue on the remaining FCC before too long, and I manage to avoid too many other distractions. I don't tend to blog 'work in progress' too often, but I thought I might do WiP's on my MERCS Megacon squads as I go, as this represents a bit of a departure for me (painting squads of minis for the first time in a few years, with an approach to painting that is a bit different than I used in my WH40K days). What I am aiming to do is paint at least a little bit (even if only for a few minutes) each day on these until they get finished. They are unlikely to be finished at the same time, as I will start to diversify the palette a little on them as I go to emphasize the rag-tag nature of House 9. 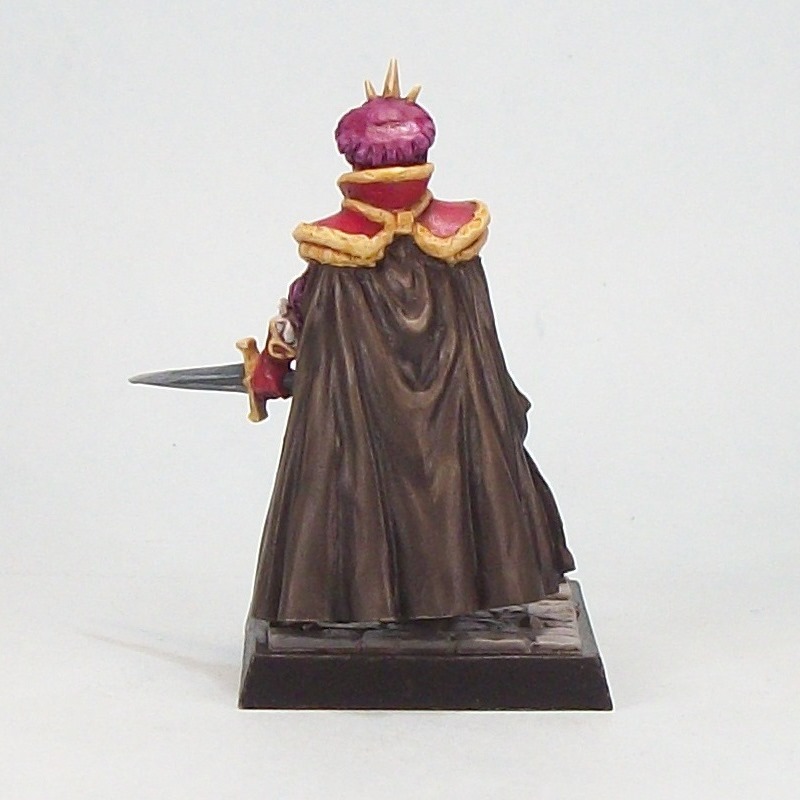 I am aiming to finish the Housemember first since that should then offer a bit of a template for the rest of the unit. Styled like the Low Walls in the previous post regarding Firedragon Games terrain (click here for link to the post), these are the last of the batch of pieces I bought from Firedragon. This particular pack is £4.50 GBP for both items, again excellent value in my humble opinion. Preparation time across all 5 pieces was brief. Painting on these was slightly complicated by the fact that the sandbags are integral, but really was no problem at all. The painting was largely as for the previous pieces, over a black undercoat. I am very happy with the five items I purchased from Firedragon. For the five it came to £12 GBP plus shipping. It has meant I have been able to ready five items useful for cover etc. in relatively short order. 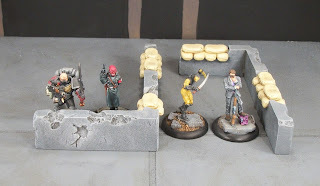 Because I am very happy with the quality, I will be ordering from Firedragon again, as I plan to pick up their bunkers, which I think will support the same kind of games I will be using these in. I have had this for a few years, and it has yet to get trotted out for a game (but maybe something soon could feature it!). That said, I do think it is a very nice piece and so wanted to say a few words about it. I am a time-strapped hobbyist, so anything that adds to my options without using up too much time is a 'good thing'. The Altar of Evil is a pre-painted one piece item, so perfect if it fits the right kind of game. I have plans soon for this, but I could easily see this in games of Anima Tactics or even WH40K if I ever take that up again, or other fantasy games I am sure. The item comes fully painted and no extra work has been done on this. It is made of polystone (a mixture of plastic resin and stone powder), and so is quite weighty. It comes in a functional box so it can be packed away safely when not in use. In terms of footprint, the diameter is around 6 3/4 inches, and the height is around 4 1/2 inches. The figures used for scale reference are a 13th Company Space Marine and Pulp City's Gentleman. Online, I have seen stockists in the UK listing it from £17.99 to £24.99. If you can get it for less than £20 GBP, and if it fits your needs, then I think it is good value. I ordered these from Firedragon Games last week when I was working out the kind of stuff I could use for MERCS games, and after finishing these pieces I have to say I am very happy indeed, and that I feel these are great products. Pictured for scale are (l-r): 2 x 13th Company Space Marines; Studio Miniatures Zombie; Infinity model; Pulp City Gentleman. 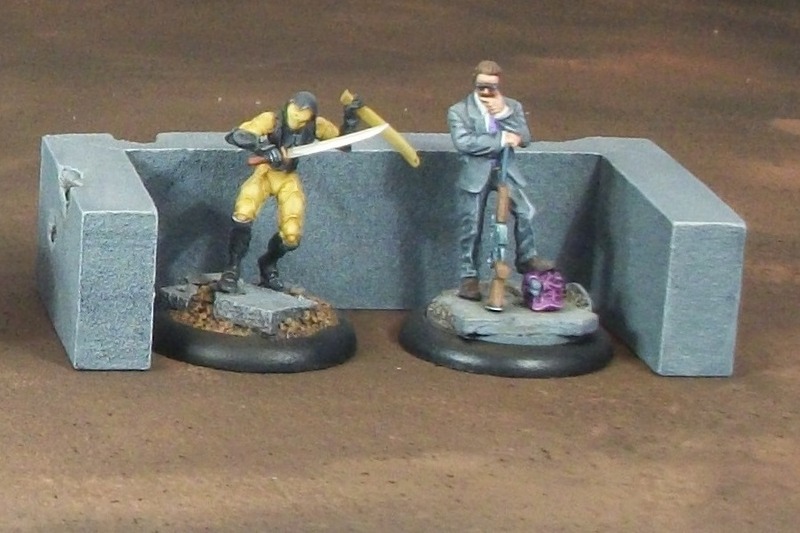 The Low Wall pieces (2 of the same piece) are currently £2 GBP each, and the Sandbagged Bunker is £3.50 GBP. When I ordered these I picked some other prices which I am still painting, and will post when completed. I think those prices are tremendous value. Yes the wall could be made of foam card, but at the price, and ready assembled, I think it is hard to argue against them. They were well cast, with only a few bubbles on the Sandbagged Bunker (which I filled with liquid green-stuff). Preperation required was only minimal, a quick scrub with soapy water as well as the liquid GS filling. I sprayed the sandbag piece with a bone colour; washed with Army painter Soft Tone; dry-brushed Vallejo Buff then Vallejo Pale Sand. 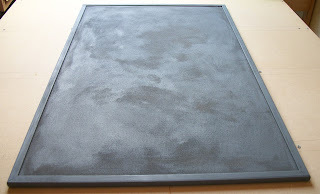 The concrete walls were undercoated black, painted with Vallejo Neutral Grey (with a touch of Field Blue here and there just to make for a slightly uneven base colour); then washed into recesses with Soft Tone; then dry-brushed Vallejo Medium Sea Grey; final dry-brush with Sky Grey; then thinned Soft Tone to mark some extra discolourations. In all I think these are great. I think they represent excellent value and do the job they need, occupying nice small footprints on a table top (but enough to comfortably fit 2 x 30mm bases), while quick and easy to prepare and paint up. I plan to use them in MERCS, but they could easily see use in AE-WW II (when I eventually get around to those! ), or similar games like Dust Warfare; Pulp City; Force on Force; and of course the venerable old WH40K. 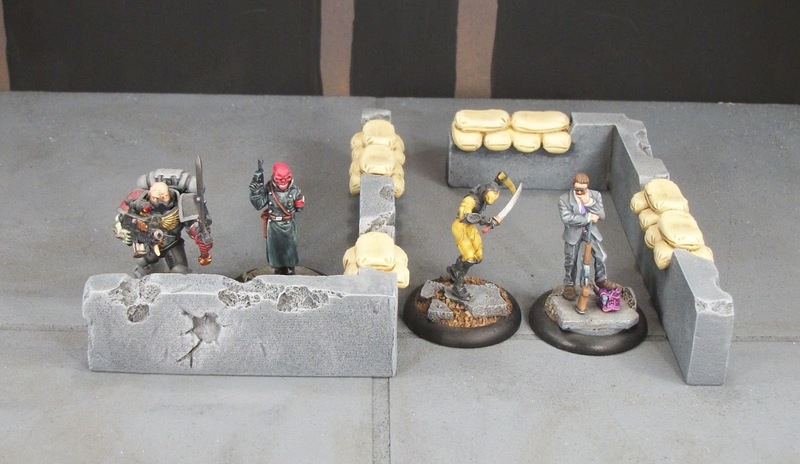 One game I play (Pulp City) and one I plan to start playing soon (MERCS) both nominally use a 2' by 3' playing area. 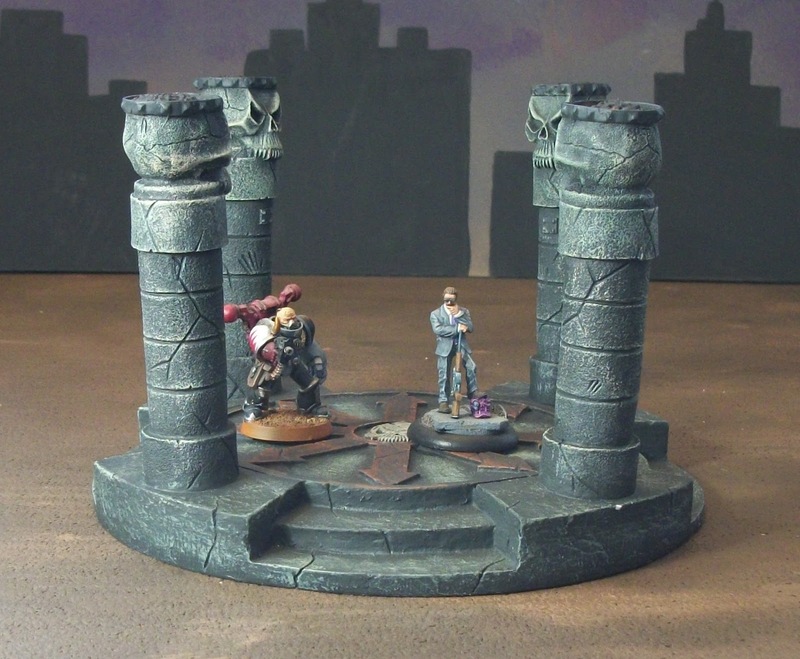 I have accumulated a few options for play areas for Pulp City already, but I got to thinking about MERCS games and wanting something I could just throw on the kitchen table when needed and slap some terrain on top of. This board is double sided; brown one side and grey on the other, so I can do urban or wasteland set-ups easily. 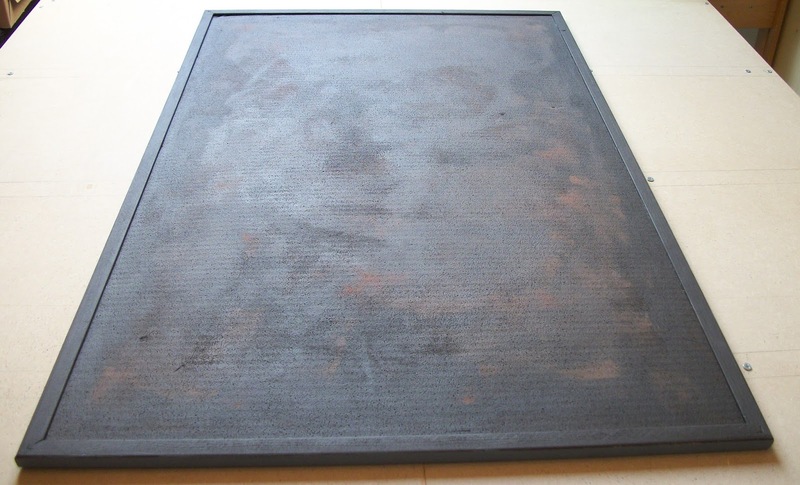 The board itself is super-easy: a 60 cm by 90 cm cork notice board. Obviously that is not quite 2' x 3', but close enough for my needs. The painting was done with cheap acrylic paints from discount shops and in all probably cost the equivalent of around £12 to £14 (I had some paint already so a guesstimate is the best I can offer). The board itself was purchased through Amazon, but as prices do vary, it can pay to look around. Each side probably had around an hour painting time at most, and the advantage of the cork is it provides some texture. I painted it by first splodging paint on and using a roller, adding a lighter colour onto a darker colour and rolling that in. The brown side then had some more colour sponged on (using very cheap household sponges). Expect to see the boards getting some use soon enough. Painting time: maybe a couple of hours all-in, over around 4 sessions. I have a new project that I am finally getting underway - I say finally, as over the past 2-3 years I have acquired the minis 4 factions for the MERCS game, and they have sat there untouched. That is all set to change. MERCS is a futuristic squad level game where each player has a force of 3-5 models (5 is the standard game size). The world is one where corporations have supplanted nations in pretty much every area of a citizen's life. Each Megacon is a vast entity, a conglomeration of an incredible array of businesses, and in the present day of MERCS just 9 Megacons remain in control of much of the world. Outside of Megacon control are the Lost Margins, territory of the FCC (Free Corporate Control), a loose affiliation of organizations that oppose the Megacons, but will occasionally work with a Megacon to further mutual goals against a rival corporation. The MERCS of the game are corporate security soldiers in super-advanced armour, the ultimate enforcers of Megacon will. Currently 7 Megacons have minis available, as well as 2 FCC 'Houses'. So far I have picked up: CCC (primarily focused on North America; their squad is the Yellowjackets; and it was their Heavy model that drew my original attention, but I was fortunate to order the rule book when it came out and acquire the limited edition Incinerator); Kem Var (South America; they use stealth technology); FCC House 9 (a rag tag looking bunch; based in the Middle East and part of Asia; the can work with representatives of Megacons as Black Ops); and Keizei Waza (Australasia and South East Asia; equipped with nuclear powered armour and a martial sense of will). I have also begun to prep some terrain to be suitable for games of MERCS (and some will be suitable for other games too), so expect intermittent posts over the next months that will directly or indirectly relate to MERCS as well as other stuff (such as wanting to paint some more Freebooters Fate minis before too long). 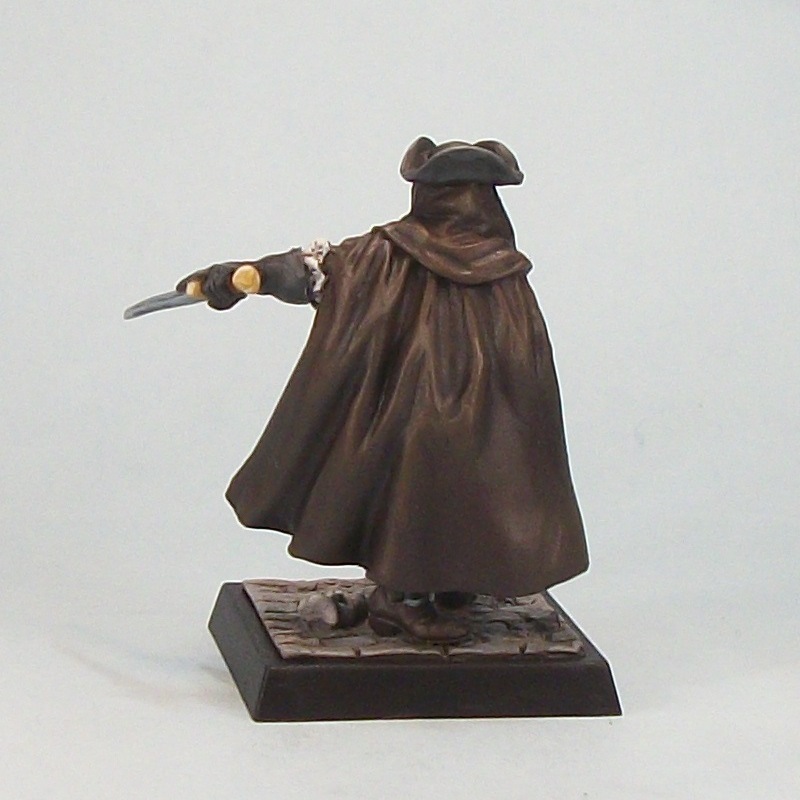 Images © 2010-2013 MERCS Miniatures. Readers may recall that this year I set out to paint more minis than last year's paltry return of only 24. I actually set a goal of at least 48, and so far things are going fairly well. 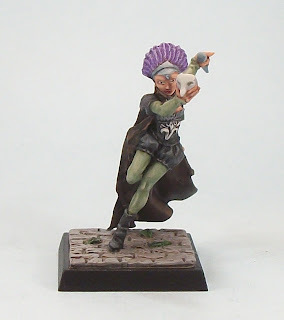 Over on the Anima Tactician I have posted Saint Aestrega (click for link), my 27th completed Anima Tactics mini, and I *think* my 39th mini of the year so far. 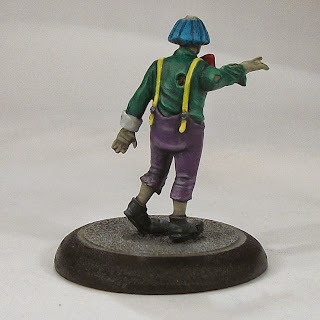 Meanwhile, over on Pulp Citizen, I have been working away on a Minion Month Painting Challenge (click for link). Here is the full Brotherhood Crew after the Painting Challenge in their sinister glory (and see here for Rob's Crew), repaired Master Assassin and all! You may spot I have re mounted the left arm at a changed angle; I am hoping that will make it a tad more durable. Still a pain of a mini to be honest! This is not strictly the Starter Set Crew, as I swapped Apagado for Bonaccia (both are Specialists with similar costs in doubloons). 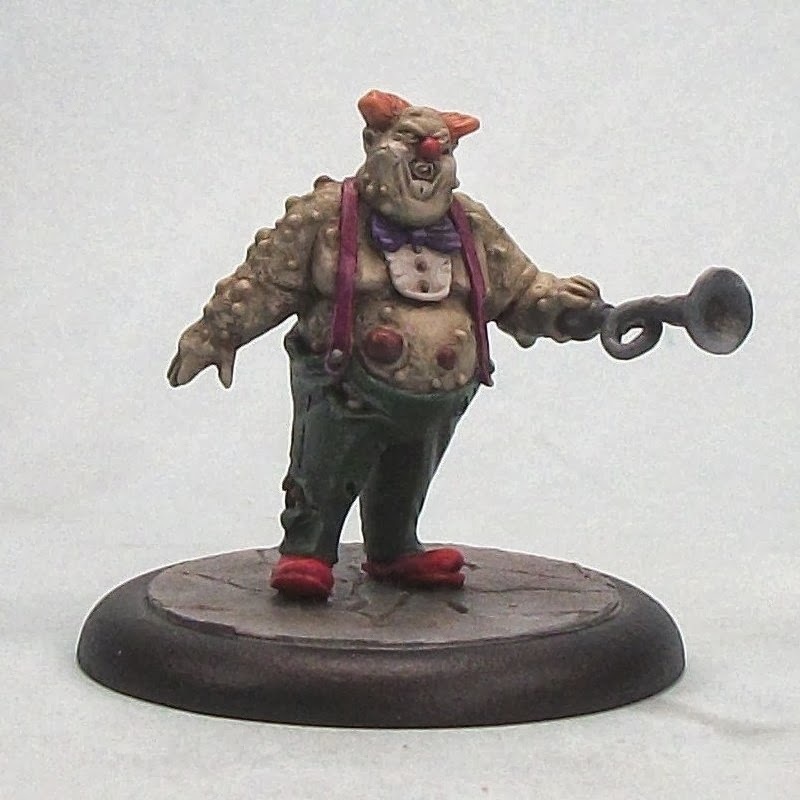 That means I have Bonaccia to paint up when I feel motivated, and Ragg Chiflad, a Goblin mini that is a 'convention only' special. I am not planning to make a Goblin Crew yet (but you never know! 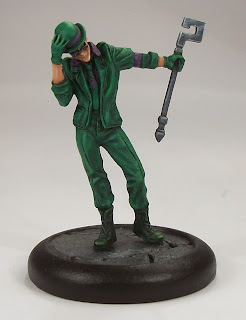 ), but he looks like he could be fun to pain once I work out his basing. 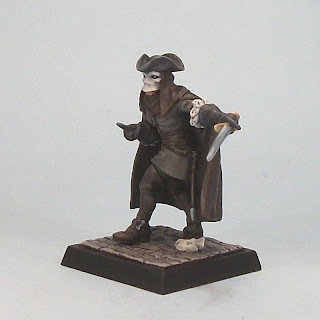 I have some more Freebooter's Fate minis on their way to me so do not be surprised to see some more in the next few months. Two days later than I hoped for, but my side of the Freebooter's Fate Painting Challenge is done. Rob inevitably got his done on time, but I am glad all the minis are finished, even if I had to right to the end of the month to do so! It has been great to see Rob's Crew building up (see here) over the weeks and it will be nice when we can get some games in with them., Who know, we may each have some more options by then. 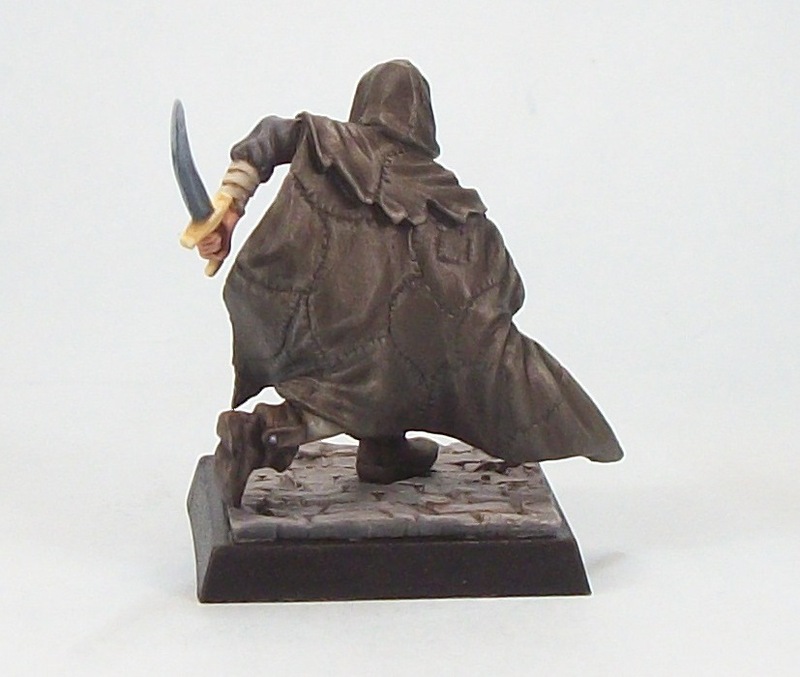 Painting the Master Assassin himself has been a big pain in the bum from start to finish to be honest. I think it is a great looking mini, just that mine fitted together pretty badly, which meant green-stuffing, which in turn meant it could not be painted in separate components. And as it had to be assembled first, it has some very hard to reach parts. Not a mini I would ever choose to paint another of I think. But it is done, and that is the main thing. Well it was until I lined up it up to take a picture of the whole Crew, and then pinged off his left arm which know needs to be put back in place. Grrr. This is far from brilliant, but it is done, which for me is the main thing given the vast numbers of unpainted minis I own! I struggled a bit with this, partly down to my poor prep as it was a pain to clean up, and then I just rushed putting it together. 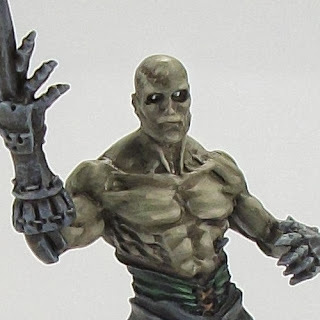 I will say that as nice as the sculpts are, some of the part fits are poor and some of the casting has been aggravating. Still, I should have been more diligent, so only myself to blame for not being so. Eagle eyed readers may noted I have not painted the hair tie; that will be rectified as soon as possible now I have noticed! Over on Rob's blog, he has stayed the course despite technical difficulties that have made blogging awkward. We are 75% done and both on course. In time we should be able to get some gaming done with these which would be nice. The Harlequin adds some minor variation to the overall colour palette I have been using with the Brotherhood, but I hope she will still look like she fits appropriately among the rest of them. Still, I felt I was rushing this (and to be honest I was), but that is part of the Challenge. I am also trying a new way of doing eyes since that has been annoying me recently, so not ideal, but I think I know how I will be doing them going forwards. In terms of the Brotherhood as a Crew, the Harlequin like the Coscritti is a Deckhand. Each Deckhand allows up to 2 Specialists to join the Crew (such as Apagado), so I will look at Specialists when I eventually bolster the ranks. Between the 2 Deckhands the Harlequin looks more formidable in terms of cost in Doubloons, but until I get some games in I cannot comment with any semblance of insight. The next mini for the Challenge is the Leader - the Master Assassin. I am still putting that together, so there is nothing quite like pressure, eh? Will I succeed? Stay tuned! My second Freebooter's Fate mini for the Paining Challenge is a Coscritti, a Brotherhood Deckhand. As near as I can tell Coscritti means conscript, so the idea of a conscript assassin is quite interesting. In Brotherhood terms a Coscritti is in fact a low-rung member, the lowest rungs of their agents who must prove their worth. In Freebooter's Fate Deckhands are the building blocks of you force along with your mandatory Leader. Deckhands allow you to pick Specialists, so you cannot focus on an uber-elite force - you always need some of the less powerful guys. With all my Brotherhood minis I aim to work with a dark colour palette to emphasize their shadowy nature, even if they are painted in a non-uniform way, masks and weapons excepted. 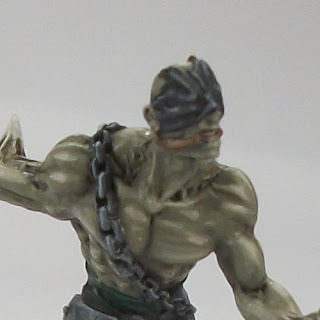 I have blocked out most of the colours on the next unit I will be painting for the Challenge, and if I can finish that blocking out in the next few nights I will be content that i should complete that on time. In the mean-time I need to assemble and undercoat my fourth model for the Challenge, so I am behind on that so far. 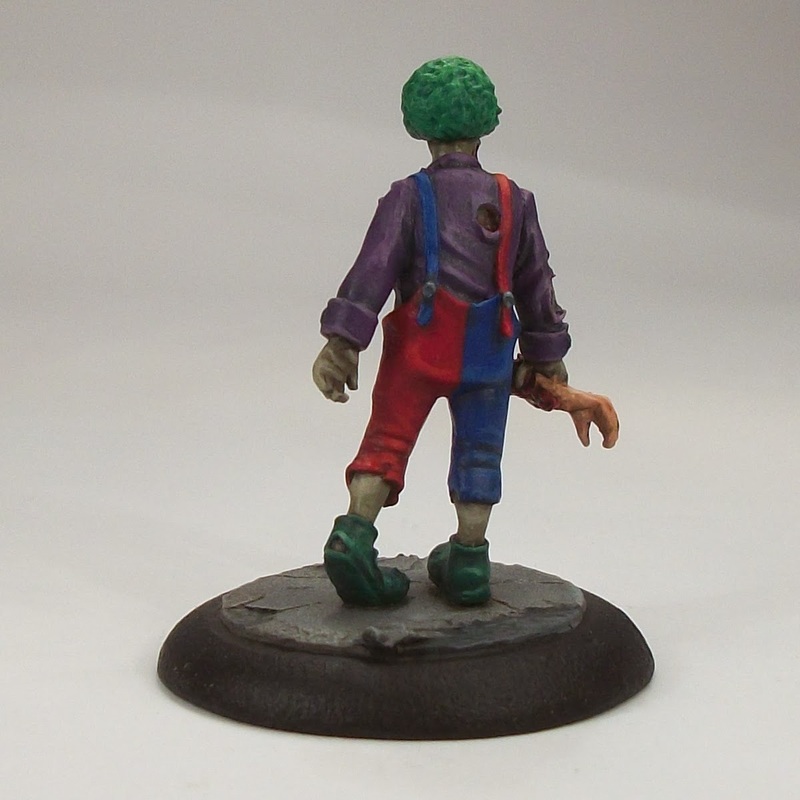 Rob has now finished his first two minis (click here for link) so we are both on course. Stay tuned to both blogs to see how we get on. 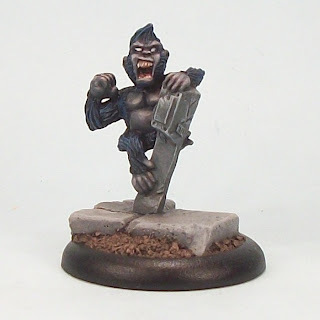 My first Freebooter's Fate mini, and my first deadline met of the Challenge. A couple of days ago I wondered if I had left too little time to finish this, especially as I planned to watch some of the Wimbledon final, but here it is, done on time. I have yet to give the game a try but have heard good things. It should be interesting to play since it is dice-less; cards are played to resolve conflicts including battles. In addition, each Faction seems to have its own unique play style from what I read in the rule-books I have picked up so far. 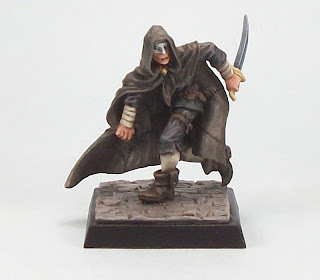 Naturally the Brotherhood are stealthy, sneaky types with special rules to reflect that. The eventual plan is that we get our respective Crews painted up; gather some scenery that is suitable; and maybe get some games in before too long. Rob kindly gave me a resin ship as a birthday present this year, and I have since picked up a cool little rowing boat from Fenris, so I hope to build up a little harbour set-up to reflect Longfall (the setting for Freebooter's Fate). I also have a growing collection of GW jungle trees, so an island jungle seems a certainty, and should be a cool alternative to Longfall-based games. We have 3 more weeks for the Challenge to go, and so far so good; however I need to keep my momentum if I am going to complete this one. 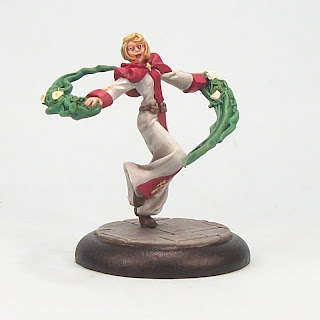 At the same time I have a few Anima Tactics and Pulp City minis on the go so if I can get more than the 4 Challenge minis painted this month I will be pleased. I have two more Freebooter's Fate minis prepped, one of which I have tickled a little with the hairy sticks so hopefully I will hit all those deadlines, but stay tuned to see how I do. Like the previous collage this was produced using fotor. 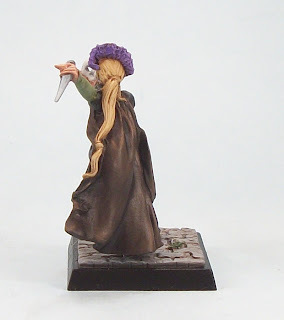 If you read the previous post, then you may recall I am aiming to paint more minis this year than last (target one), and ideally want to hit at least 50 minis (target two). Well target one is already achieved as of this month. 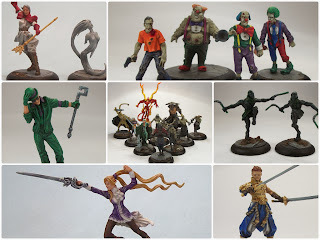 I have now painted 26 minis this year in 6 months, versus 24 in 12 months last year; and that is even with some big minis in the assorted paint-jobs of 2013. 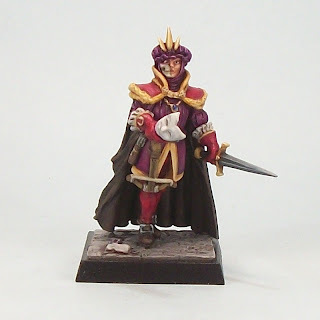 In point of fact, I also painted an exchange mini, but for this count I am focusing on those minis staying in my own collection! First new post on here for a while, but hopefully there will be an increase in activity over the next month or so as I launch into a new Painting Challenge. If you have read my Pulp Citizen blog (click for link), you may recall that I have gone in for a few Painting Challenges, and they are useful for focusing my wandering attention I find. 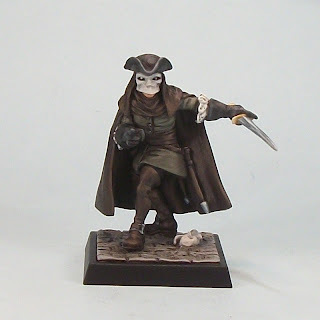 Well recently I have taken the plunge into getting some of the gorgeous Freebooters Fate minis (settling on the Brotherhood as I like the assassin aesthetic), and my main gaming buddy Rob has some Pirates - so the only left was to ensure we get around to painting them. Consequently we have decided to set July as our Freebooters Fate Painting Challenge! 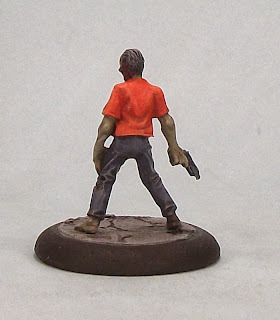 The goal is simple: paint one mini per week to create a Crew of at least 4 minis by the end of the month. 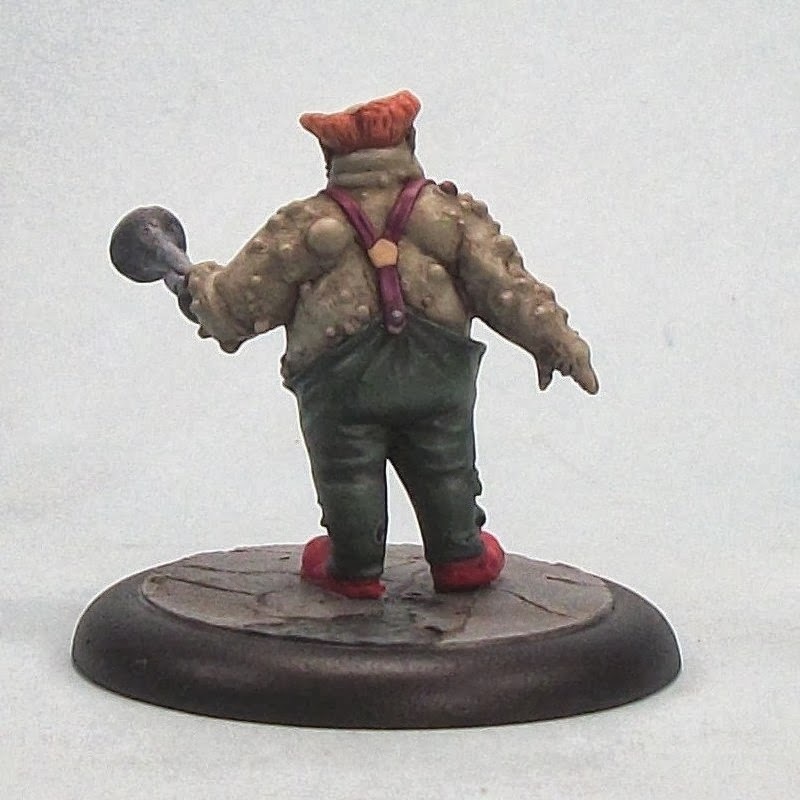 Now with the speed Rob paints at, I suspect he will be fine, but hopefully I will deliver on my end of the Challenge. The deadlines are each Sunday - the 7th, 14th, 21st and 28th, so stay tuned! A quick shameless plug for one of my other blogs: Anima Tactician. Anima Tactician (link) is Anima Tactics-centric; therefore the content is all about my forays into that game and related topics. 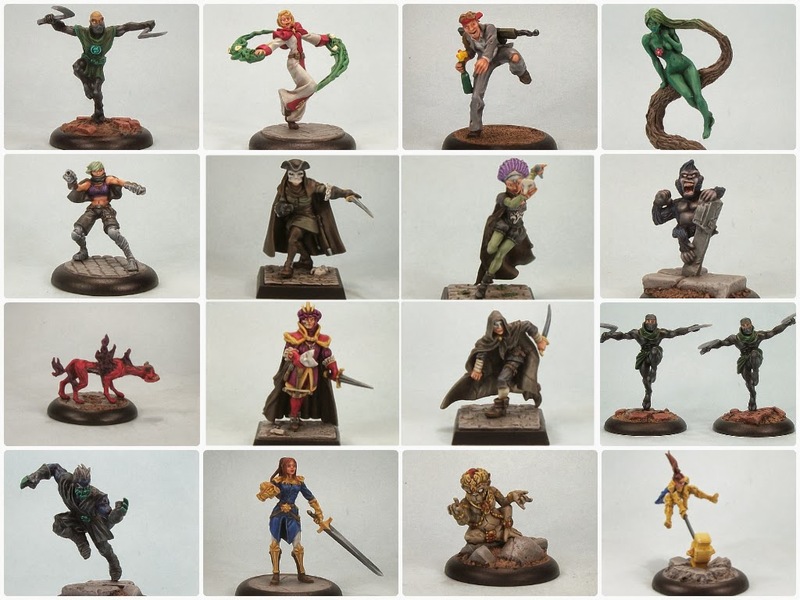 Anima Tactics is a tabletop minis game, using a pretty low model count, and clearly influenced by Japanese console rpgs such as Final Fantasy, Suikoden, Breath of Fire et al. 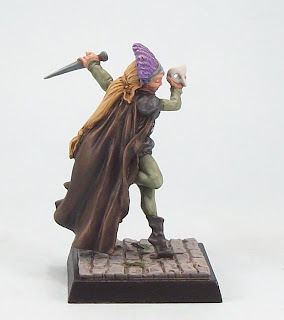 So far I have painted 13 minis for the game (having kicked off my painting in earnest late last year), and I hope to get that to around 30-40 by the end of this year - eventually I would like to have at least one painted example of every mini in the range. So please come across and check out the blog as I stumble through what is for me a fairly new hobby diversion.